PURCHASE TICKETS & SPONSORSHIPS FOR THE EVENT HERE! Congratulations to our 7th Annual Long Island Imagine Awards Finalists! 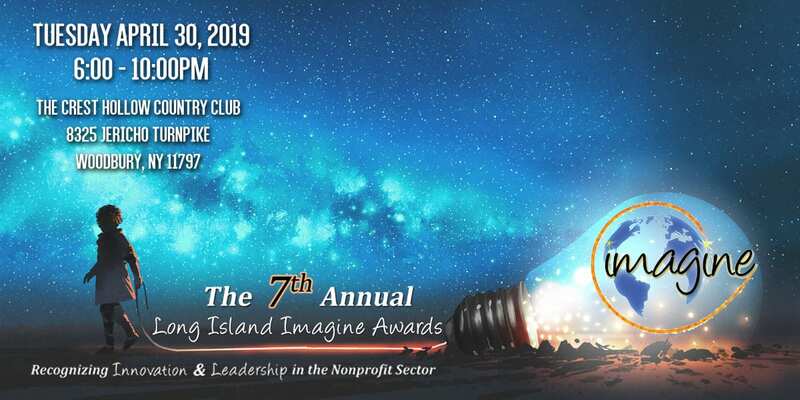 The 7th Annual Long Island Imagine Awards will be held on April 30, 2019 at the Crest Hollow Country Club from 6:00pm – 10:00pm. Fan Favorite Award – Results are In! This Imagine Fan Favorite Award voting campaign sponsored by Nerds That Care launched on Monday, March 25th. This voting campaign was on the Imagine Awards Facebook page and gave you a chance to vote daily for your favorite Imagine Awards’ Finalist. The Finalist that received the most votes by midnight on April 15th will be announced and honored during the Imagine Awards on April 30th and will receive a $2,500 check. This $2,500 is in addition to the other five awards given during the night. 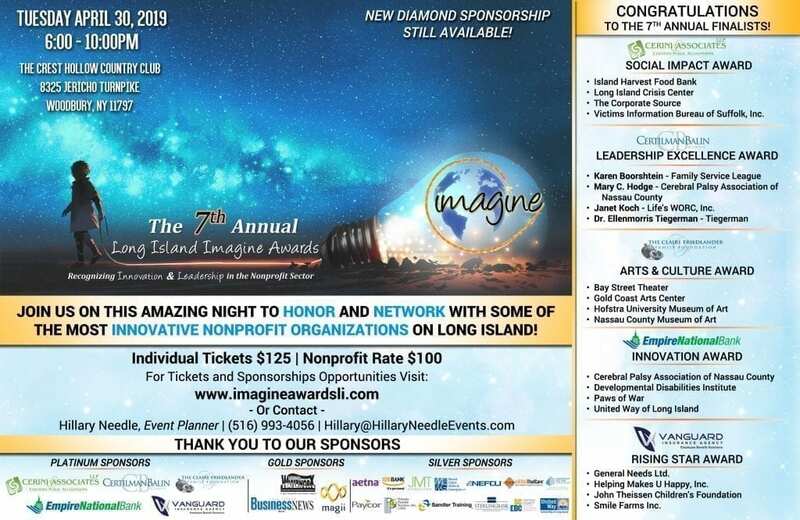 Sponsorships Available for the 7th Annual Long Island Imagine Awards! Check out our New Diamond Sponsorship Level! Join us for the 7th Annual Long Island Imagine Awards! The ceremony is scheduled for Tuesday, April 30, 2019, 6:00pm-10:00pm at the Crest Hollow Country Club, Woodbury, NY. This event was created to formally acknowledge some of Long Island’s most effective and innovative nonprofit organizations. $5,000 grants to be awarded in the following categories: Social Impact, Innovation, Arts & Culture, Rising Star & Leadership Excellence. Tickets are $125 but nonprofits can purchase them at a reduced rate of $100. We hope you can join us to celebrate the achievements of these amazing organizations. We are excited to welcome back our Emcee from last year’s event, Doug Geed, for the 7th Annual Long Island Imagine Awards!